...If the people in Washington insist on flooding the country with helot labor, despite what’s happening in the election, the people are going to insist on building scaffolds in Washington. The Trump phenomenon is the warning. ...I, and many others, have said repeatedly that Trump is no conservative. He is, however, pro-America. His slogan, make America great again, resonates with conservatives of all stripes. On the other hand, it is anathema to liberals, who believe that America never was great, and certainly don’t want her to start being great now. And Trump, like no one else, pushes back against the Left’s efforts to suppress free speech, which usually go under the too-generous rubric of political correctness. A new conservatism is, to paraphrase a long-dead crank, struggling to be born. It will not emerge between now and November, but the next six months should shed considerable light on the shape of the conservative movement in a post-Reagan era. ...There will be a lot of second-guessing and "what ifs" thrown around about whether this could have been prevented. What if there weren't as many candidates to begin with? What if Cruz had attacked Trump earlier? What if the anti-Trump movement had started spending money on attack ads in December? What if Sen. Marco Rubio hadn't stumbled at the pre-New Hampshire debate? What if candidates had dropped out sooner, allowing anti-Trump Republicans to rally around an alternative before it was too late? This is mostly a wasted exercise. 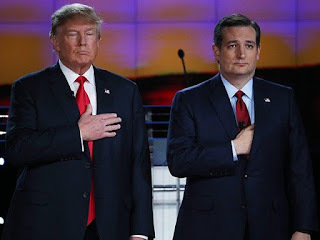 It's quite possible that if Cruz had attacked Trump earlier, he would have collapsed ahead of Iowa, as with other candidates who got in Trump's way. It's unclear why ads attacking Trump's character, business record, electability, or conservatism, would have proven any more effective months earlier. Since one can neither intuit Trump's intentions nior get a firm grasp of what he actually believes one can always consult a seer. I suspect this is what the Trumpsters did. Or they drank the Kool Aid. Unless he makes an effort to demonstrate what he will do concretely, I'll sit this one out. To me Trump is the flip side of Obama, more hope and change. I am as mystified as you are. Cruz seemed like a no brainer. If your intention is to "sit this one out" I would ask you to consider what the Supreme Court will look like in 2024, let alone the executive and the associated administrative state. I believe it is the duty of all true conservatives to put aside justified contempt for Trump and the Trumpkins. We simply will not have a voice in 2024 if Hilary and her Fabian ilk are let loose on what is left of the philosophy of a constitutional limited republic. We cannot withhold 10M plus votes as we did against Romney. If we can demonstrate the same sort of enthusiasm in the general as we have in the primary our numbers will continue to dwarf the Democrat party. Failure to participate in this one will very likely result in increasingly worse candidates than Trump in the Republican future. "the flip side of Obama"? Obama targeted Republicans, the TEA Party, Christians, Whytes, Law Enforcement, Israel, legal gun owners, GM Stockholders, expanded the Patriot Act after promising to cut it back, gave us ObamaCare and Cash-for-Clunkers, quadrupled the US Debt, gave "more flexibility" to Russia, destabilized the Middle East, bowed to the Saudis, allowed illegals to cross the border unchecked, and refuses to speak the phrase "radical Is Lamb Bic t3r0r1st"... oh, and also over 200 rounds of golf. If Trump is indeed "the flip side of Obama", it might actually be a good thing. And, if he's simply a RINO in disguise the USA is heading towards secular socialism anyway so at least we got to be entertained along the way. Of course, you could always read my 2016 Political Platform - states do allow write-in votes, LOL! It's a mistake for conservatives to sit this out. It's also a mistake for GOPe to sit this out. Look, we don't always get what we want. But we have to work with what we get. We can't work with Hillary. We won't be invited to the table. It will be Obama all over again, only worse. And if people sit it out, down ticket could flip the house and senate. Trump is the republican party candidate. We might not like everything he ends up doing. Fine. But we can work with him. Conservatives have influence with Trump. Trump may not be a strong policy wonk with firm positions on every issue. He is smart however. And, he loves the country. Trump needs conservatives to explain why conservative policies are best for the country. Now he may not adopt all of them and he'll water down others. But the flip side is Hillary and if you think any conservative idea is gong to pass muster with the gays, the transvestites, the socialists, the greens, the labor unions, the teacher unions, and the trial lawyers - all stages that any "progressive" policy must pass before implementation, then you're barking up the wrong tree. Be part of the solution. Sit it out and you're part of the problem. Too bad all these concerned "conservatives" weren't around to protest the fraud Obama from gaining office. Now that the Manchurian candidate is almost finished doing as much damage to the country as he can, it's time for a real American patriot to step up and undo as much of that damage as possible! I'm so happy that an extremely talented businessman wants to put America back into action again, in the best way. That man is Donald J. Trump! If you still think Ted Cruz was the missed opportunity of a lifetime, maybe you should take a few minutes to watch this short video from Bill Still, who has done the homework you guys should have done, instead of drinking the Cruz Kool-Aid, served up by Crazy Glenn Beck. OH, NOES: More Clinton Emails!